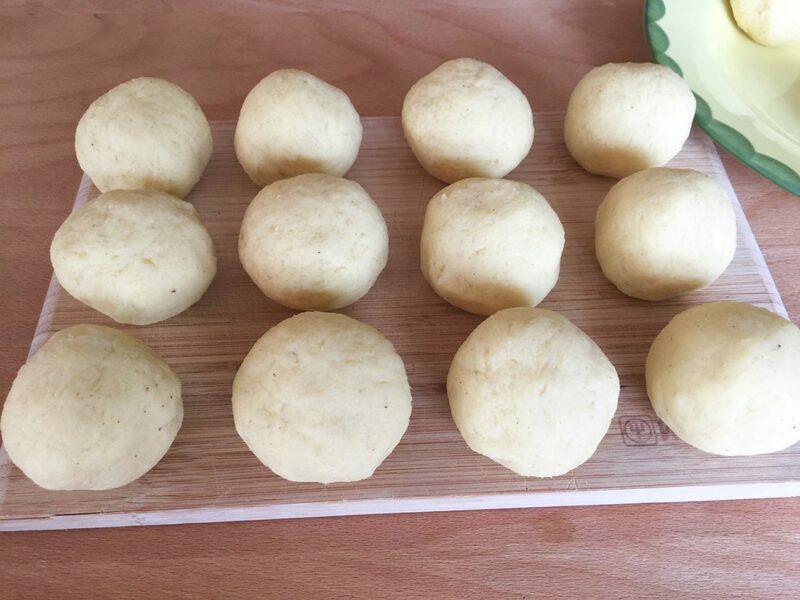 Classic German Potato Dumplings are called gekochte Kartoffelknödel or Gekochte Kartoffelklöβe. In a large saucepan filled with water bring the washed potatoes with the skin on to a boil and let them cook for about 20 minutes. Place them in a colander and rinse under cold water. 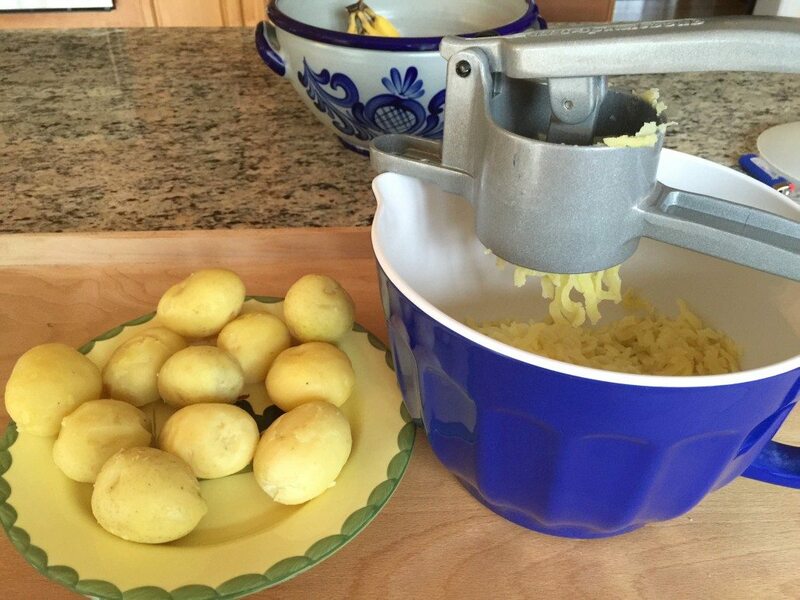 Peel and press them through a potato ricer into a large bowl. Set them aside to allow the potatoes to cool down. 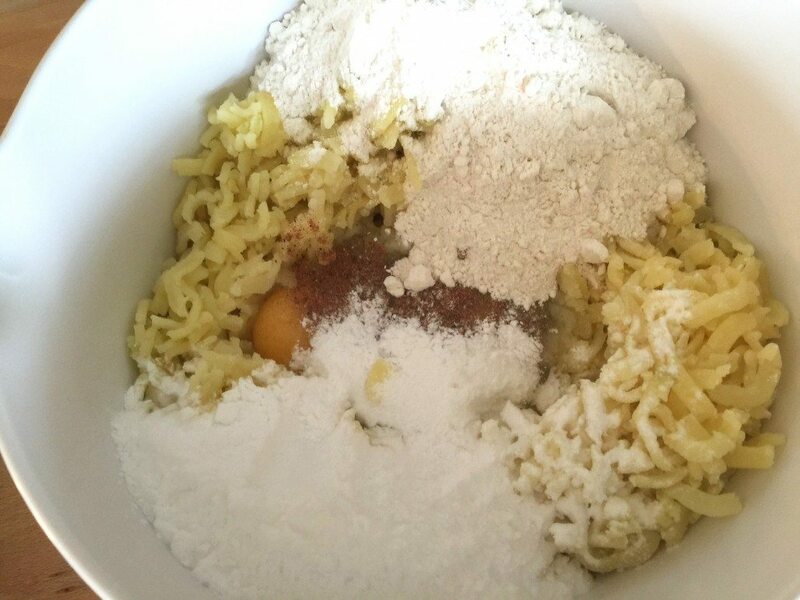 Add the eggs, flour, potato starch, salt and nutmeg to the cold potatoes and mix until the ingredients are combined. 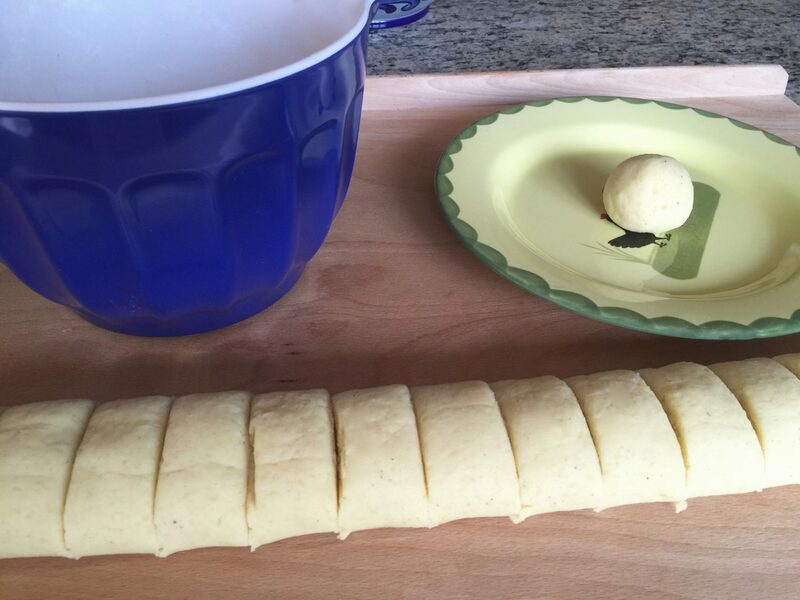 Form a roll about 5 cm (2 inches) in diameter; using a knife cut the potato dough into slices about 3.8 cm (1 ½ inches) wide and form the dumplings with your hands. Makes about 20 dumplings. Bring a large saucepan with water and two teaspoons of salt to a boil. Place the dumplings into the boiling water. They will sink to the bottom of your saucepan and the water will cool down a little. 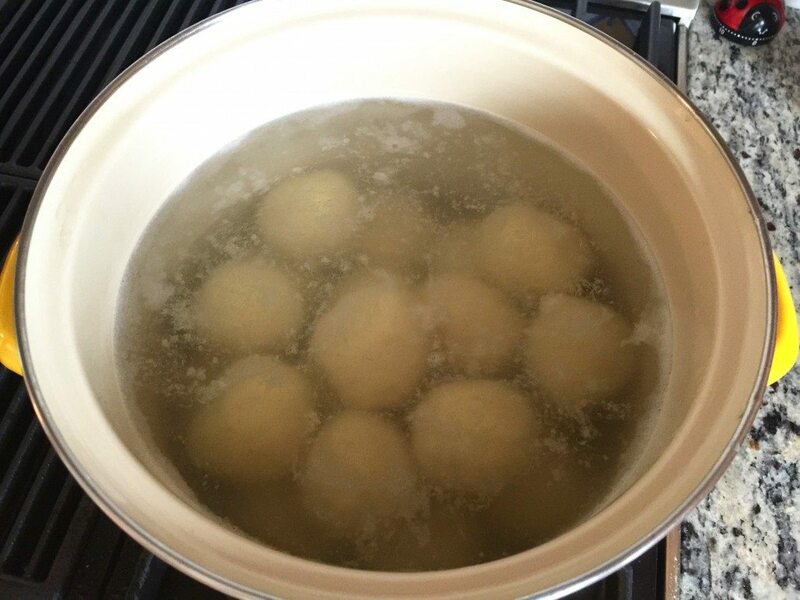 When the water starts boiling again turn the heat down and let the dumplings simmer for about 10-15 minutes or until they float on the surface. Use a skimmer to remove the dumplings from the water and place on the serving plate. You can serve the Potato Dumplings with one of Oma’s meat recipes with gravy like Goulash, Beef Roast, Pork Roast, or Beef Stroganoff. 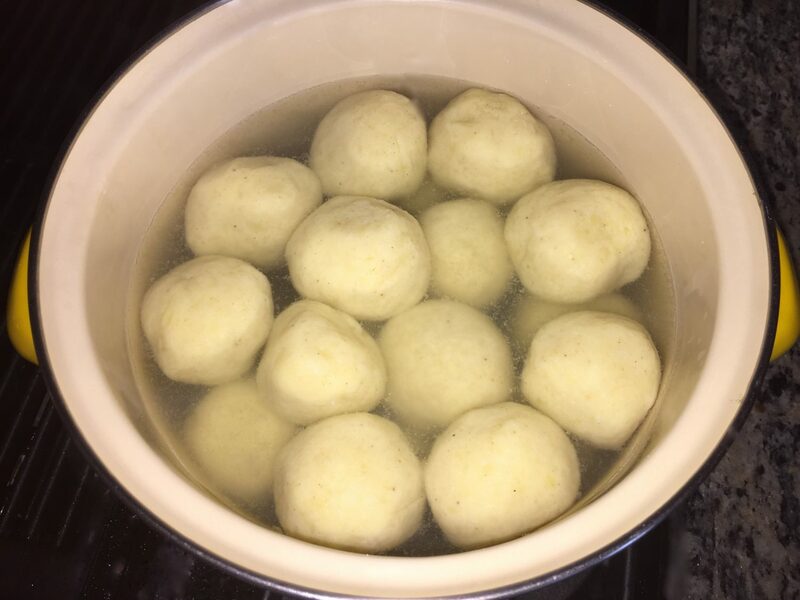 To try the German Yeast Dumplings click here, German Potato Dumplings Half&Half click here, and the German Bread Dumplings Recipe click here.